Valentines Day and that very special card. She loves me ... she loves me not! Keep him guessing on Valentines Day ... don't sign it! 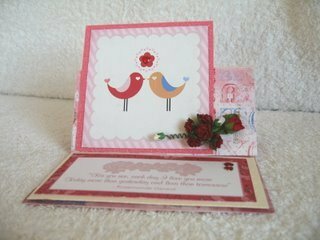 This special day makes everybody want to send, and hopefully receive a beautiful card from someone. Whether you know who sent it or not. February 14th is the date to remember, and it's traditionally, the day to tell that special person in your life just how much you care. But this is the time that the prices rocket in the shops for the cards that you want to buy, and the smallest of them can cost a fortune. So why not have a go at producing your own, and make it as special as you want. 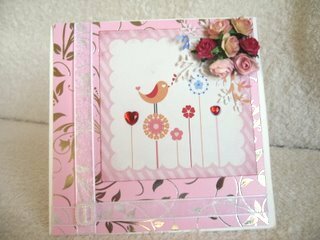 It's the time you can let your imagination turn to Flowers, Glitter, Gemstones Eyelets, and shiny Brads which can all make that difference to the finished card and are some of the things to consider. Try some pastel colours, and pay special attention to the verse. There are lots of verses and words to be downloaded from the internet and don't forget the CD's you can buy with verses in them. Have the courage to write your own verse. If you are good at it then consider writing and supplying companies that are always on the lookout for good verse writers. This card is from a digital kit, and if you want to buy some lovely papers and characters click the link to go to the shop. 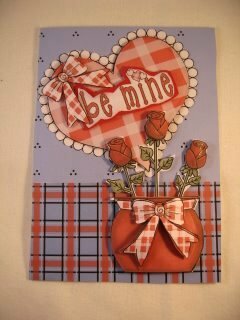 Where you will find more of my designs using the Valentines Days kits. Here's some more fabulous ideas. Make them in different colours, especially if you make them to sell. Men like to receive them too. 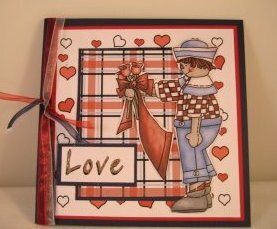 Try these Easel cards for an effective look. 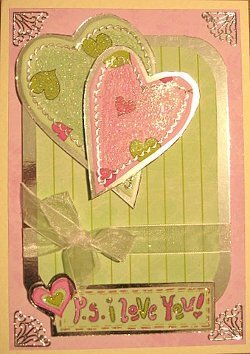 All these cards are easy to make, and look spectacular. They would be a pleasure to give and even better to receive.....especially from the mystery person!! You could always combine this card with e really special gift for the one you love, and what could be better than some perfume? Precious Womens Perfumes for some cool ideas on what to choose for any time of year. Return from Valentines Day to Homepage.